Pg. 5, CZ Elegance Necklace & Earring Gift Set, $16.99. Shine bright like a diamond this Valentine's Day! Pg. 11, Ultra Luxury Lip Liner is available in six shades to go with all your lipstick shades and only $2.99 this campaign. Pg. 13, Big & False Lash Volume Mascara has quickly become a customer favorite and is only $6.99 right now. This mascara is one that is also available in Brown Black. Pg. 19, Ultra Color Lipstick is any 2 for $10 for twice the fabulous! Pg. 24, Beyond Color Lip Conditioner and Lipstick are each $4.99. Pg. 31, Four of our popular mascaras are any 2 for $7.99. If one of these is your favorite, this would be a good time to stock up. Pg. 39, ALL makeup brushes are 50% off!! Pg. 40/41, Today, Tomorrow, Forever, and Amour are any 2 for $30. There is a scent spot for Amour on the page. Pg. 55, Mesmerize Cologne Spray for men is LPE of $9.99. This has been a customer favorite for many years. Pg. 56, Men's Talc Powder, Hair & Body Wash, and After Shave Conditioner are any 2 for $5. Pg. 69, Anew Clinical Advanced Retexturizing Peel is LPE of $12.99. Pg. 70, Anew Clinical Eye Lift Pro Dual Eye System is only $13.99. Pg. 75, Do you prefer basic skin care? Avon Elements products are all on sale. All of these products are hypoallergenic. Pg. 135, Naturals Shower Gels are $1.99 each. Pg. 140, Take care of your feet this winter with our Foot Works products. Save up to 55% on these! Pg. 153-155, SSS Bath Oil in the 16.9 fl. oz. size is $6.99 each while the bonus size lotion and 24 fl. oz size Bath Oil are $9.99 each. Pg. 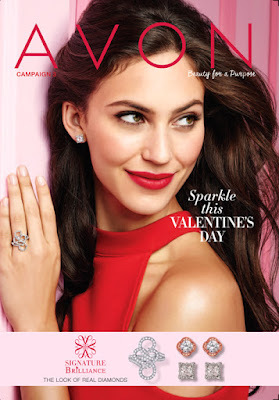 163, Avon Care Daily Basics and Avon Solutions products are any 2 for $6. Back cover, Full Size Hand Creams are only $1.69 and available in 3 SSS formulas, 3 Moisture Therapy formulas, and Silicone Glove. *There are a lot of tutorials in the first few pages of this brochure - for brows, lips, eyes, nails, and face sculpting. If you want to save even more money, you can join my team of Cloud Climbers, receive a discount on every item you purchase, and save even more by ordering new items when they first appear in the demo brochure. Attention! It's Avon's National Recruiting Week!! Valentine's Day. Are you ready? Don't You Just Love Winning Stuff? I do! Ack! What do I do with THIS?! ?